Cover detail from The Making of Planet of the Apes. J.W. 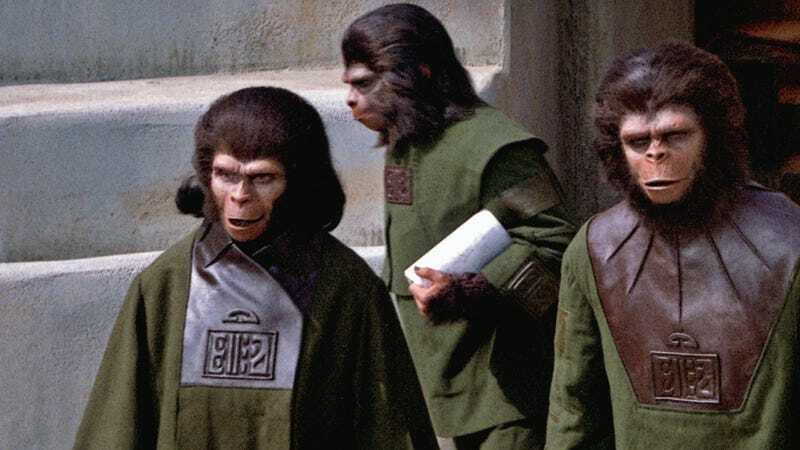 Rinzler’s The Making of Planet of the Apes, due out October 23, is packed full of concept art, photos, and other behind-the-scenes documents that have never been published before. It also features a foreword by Fraser Clarke Heston, son of Charlton Heston, who played stranded astronaut George Taylor in the 1968 film. 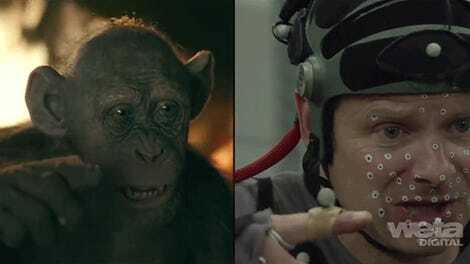 Obviously, long before the advent of CGI and the motion-capture technology used in War for the Planet of the Apes and the other prequels, things like set design, prosthetic make-up, and practical special effects were a huge part of bringing the original sci-fi tale to life. Mentor Heubner’s sketch #12 depicts a pipe-smoking ape standing on a flagstone patio in front of his house. Top: An illustration by Don Peters and a detail from it (right): The astronauts use their jetpacks to explore a lusher environment. Below: The explorers encounter ominous scarecrows, meant to keep intruders out, an idea conceptualized for the first time by artist Peters. The scarecrows are simian in appearance. Image: Courtesy of the Arthur P. Jacobs Collection, Coll 023 Department of Archives and Special Collections, William H. Hannon Library, Loyola Marymount University. A good view of Apetown. The two-thousand-acre ranch was convenient to Fox headquarters and provided many locales for Apes, as it had for dozens of studio productions since 1939. Left Top: The finished gazebo on the lake walkway. Left Right: A good look at the Apetown “units,” including two smaller ones built on the hill using forced perspective, and farther up what looks to be a painted façade. A double for Heston as Taylor runs across an elevated walkway. Clockwise from top left: Two sketches illustrate how [director Franklin J. Schaffner] intended to shoot down on [characters] Taylor and Nova as they arrive at the foot of the statue: First, he would “zoom back to include torch” using the foreground “miniature”—a scaled, aged replica of the real torch. As they rode on Schaffner would film with a Panavision 50mm-to-500mm lens to “zoom through spikes” through the second foreground “miniature.” Later in the day, Schaffner filmed [Charlton] Heston and [Linda] Harrison standing next to their horse as the astronaut gazes in horror at Liberty’s crown. Last, a photograph taken from the platform as Heston and Harrison ride by the torch. Excerpt from the book The Making of Planet of the Apes by J.W. Rinzler. 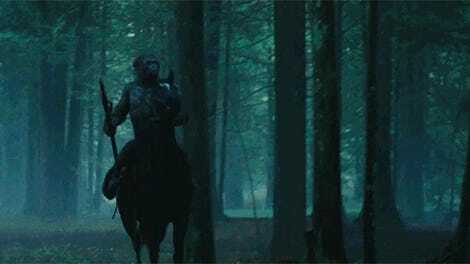 Copyright © 2018 by Twentieth Century Fox Film Corporation. Published on October 23, 2018 by Harper Design, an imprint of HarperCollins Publishers. Reprinted by permission. 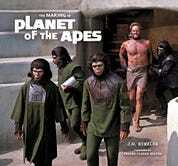 The Making of Planet of the Apes by J. W. Rinzler is out October 23.